Meet the taxi meter that would take over the world. 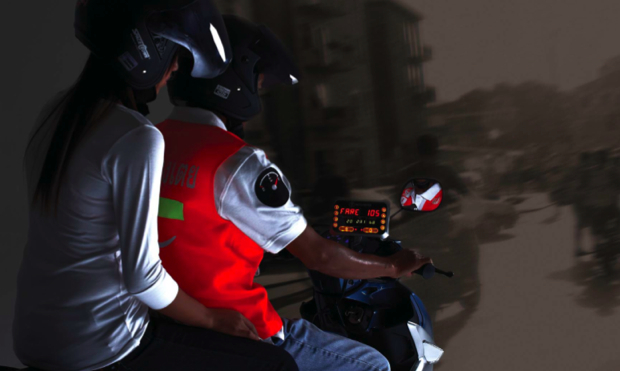 World Moto wants to bring meters–durable, advertising-enabled, black-box-housing, tamper-proof meters–to the 200 million motorcycle taxis that are so popular in the developing world. As gadgets go, it’s hardly the sexiest. It’s a meter. For taxis. For motorcycle taxis, to be precise. And yet it might just be a $3 billion dollar idea. 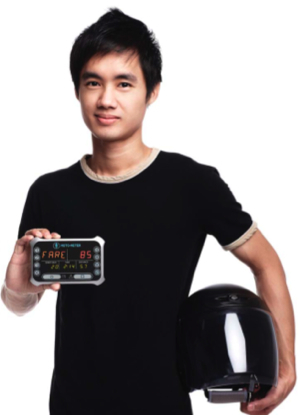 Paul Giles, President of World Moto, whose new Moto-Meter hits the streets of Bangkok in March, remembers when he first got the idea for his product. An American ex-pat in Bangkok, Giles was hanging out with some motorcycle taxi drivers. It’s a common profession in Thailand, where traffic often clogs the path of cars, leading some 700,000 Thai men and women earn their living by weaving moto-taxis in and out of traffic. In recent years, moto-taxis have become wildly popular not only in Thailand but across the cities and towns of Asia, Africa, and South America. In mega-cities like Bangkok, Laos, and Sao Paolo, their growth has been exponential. But moto-taxis have sprung up as a mostly unregulated industry. Lacking meters, moto-taxis’ fares are subjective–the sort of situation that leads to knowing admonitions in Lonely Planet guides, and surly behavior on the part of tourists and taxi drivers alike, each mistrustful of the other. Giles hopped on Google immediately, convinced someone else must have had the idea before him. He entered “motorcycle taxi meter” and pressed search. “It’s amazing, you can close your eyes and type on the keyboard a random set of number and letters, and you’ll get results on Google,” he says. But his search query turned up nothing. He tried every hyphenated and compound-worded permutation he could think of: “moto-taxi meter,” “motorcyle taximeter,” and so on. Nothing, nothing, nothing. “No one had even thought of it, not even in any blogs, not even in blogs where people talk about the pricing of taxis.” He started buying up domain names. He began working on the idea, joining forces in 2008 with another America-to-Thailand ex-pat, Chris Ziomkowski, now World Moto’s Chief Technical Officer. The more the two researched, the more opportunities they realized there were for innovations in motorcycle taximetry. That was an obvious one. The team soon realized, though, that apart from digitization, the taxi meter had barely been revised since it had been invented in 1891. They came up with idea after idea–“feature creep,” they call it–taking their time implementing each one. Another innovation is the black box — a device recording data in the event of an accident. These are familiar from airplanes, of course, and have also made their way into automobiles, initially as part of the airbag system. Since motorcycles don’t have airbags, there was never a similar evolution in data recording for bikes. “Why not?” says Ziomkowski. “They [black boxes] reduce accidents. Just the knowledge that someone is monitoring driving behavior tends to change the way drivers drive.” The black box will record speed, acceleration, braking information, crash force, and even when passengers are sitting and when they’re ejected from seats, all data of interest to law enforcement and insurers. Thousands die each year in Thailand from motorcycle accidents (though moto-taxi drivers tend to drive much more safely than those who merely dabble in biking), and World Moto wants to help reduce that figure. Finally, the team also developed an anti-tampering feature to further assure customers they’re paying a fair rate. 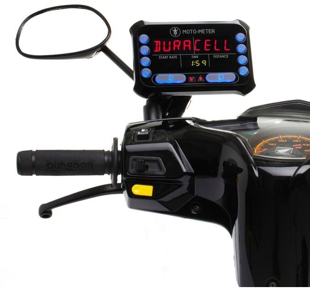 If motorcycle taxis tamper with the meter, it shuts down. They poured about $1 million, all told, into the development of the device. “There will be uses for [Moto-Meter] we can’t even predict,” says Giles. The device runs about $180, cheaper than a standard taxi meter, says Giles. With moto-taxi drivers making a nice middle-class wage in Thailand–in Bangkok, they make more than teachers, nurses, and construction workers, he claims — they can afford it. And by reducing acrimony and averting lost potential fares, it should pay for itself soon, goes the logic. The market for the device is potentially enormous, with 20 million moto-taxis in the world and counting. Hence the potential $3-billion figure Giles estimates.